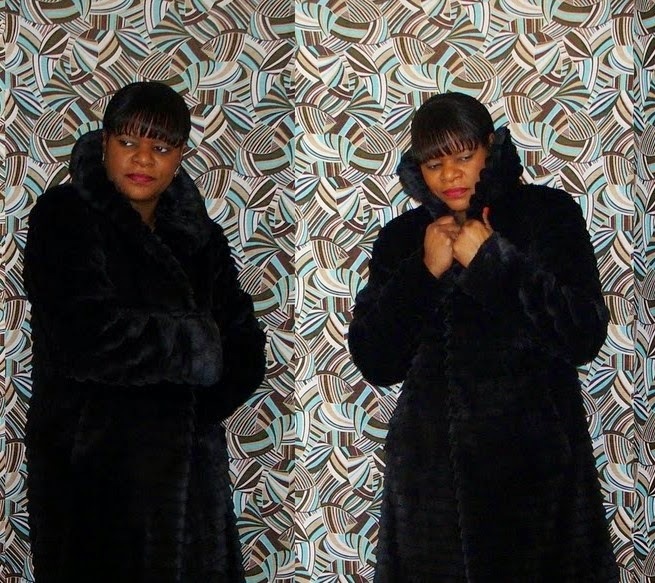 I have wanted a faux fur for some time and thought about making one for just as long. However, I never got around to making one. With the wedding fast upon me like the next day, and wanting to wear one with my dress, and being that I had to make a pit stop at Burlington Coat Factory annnnnyway, it was the perfect opportunity to buy one. 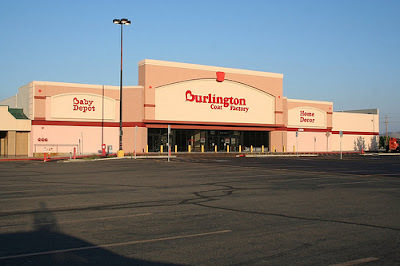 Burlington Coat Factory use to carry a large selection of faux furs, but guessing they are not in high demand as they use to be. The faux fur inventory was scarce, but there were sufficient puffy coats and wool coats. Mixed in the lot of coats were a measly few faux furs and there squashed between a faux mink look alike and a sable faux fur was a cute black one. Tried it on and it was perfect. Of course, the one pic that was taken of the bride and me is blurry with a mix of someone's shoulder and the back of someone's big head... umm yeah. 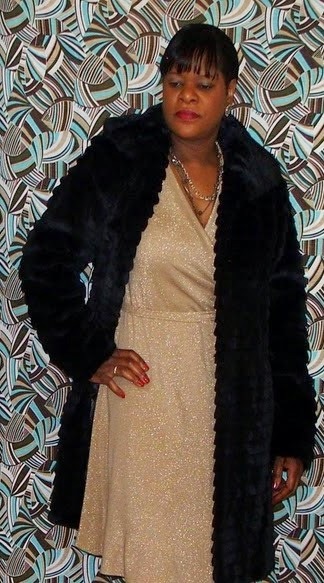 The coat was perfect, the temps had dropped last nite and I was as snug as a bug in a rug. Cute look! Funny about the children's room and the cake! You look fantastic! Great find on the coat. It goes really well with that beautiful dress you made. Your fur looks spectacular, as, of course, does your dress. Love that coat, it looks great on you! LOL, you sound like me hiding with the children. You looked too nice to be hiding though! Love the dress. You look like a movie star!!!! Great combination! The coat is fab and as Handmade says, "You look like a movie star." The dress is quite lovely. LOL about the children's room and the cake. Beautiful! Very nice choice! I think a girl has to have a faux fur at least once in her life time!! I made one many years ago in my "younger days"! It was all white and soooo soft! It stood out too because I was wearing it in the winter!! Very daring...but I was young and didn't know any better!! Love yours!